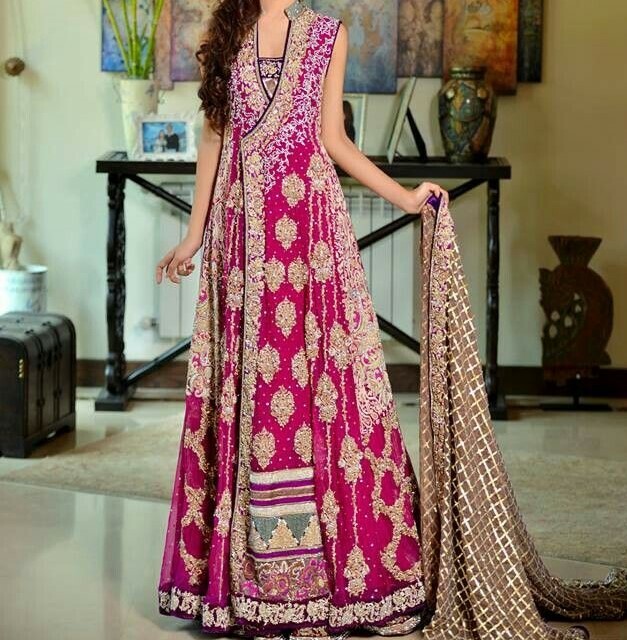 Pakistani Bridalwear and Trousseau Collection are truly works of art in our country. 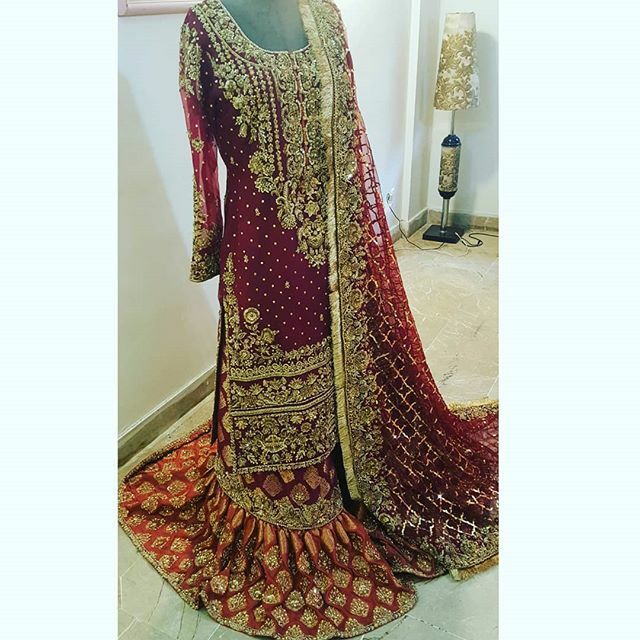 Many women start designing Pakistani bridal wear from the house. 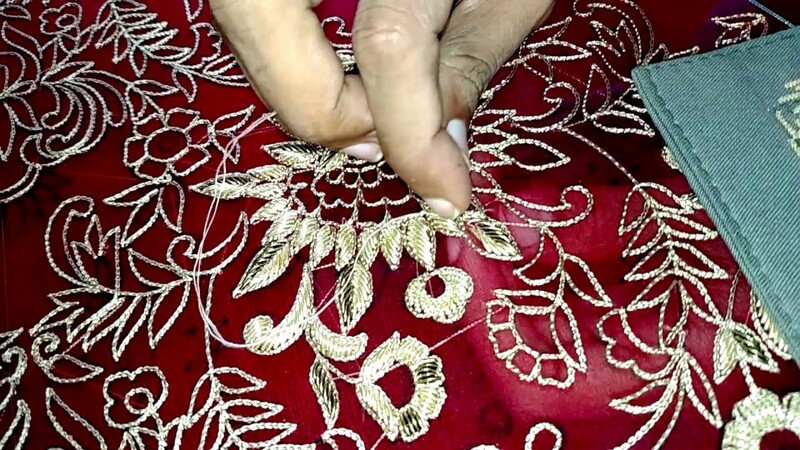 Replicating traditional designs in golden thread work - all hand made - they produce that special outfit for the wedding day and for the banquet by the groom's side - known as Valima - the two special days of wedding celebrations. The colors in vogue for pakistani bridalwear for the wedding day are various shades of red with contrast of green, orange, maroon, purple and any other that the designer finds right ... On the second day of the wedding is the Valima day, the colors are more in pastel shades like light jade, light turquoise, light blue with green borders...and the fantasy goes on. All these outfits are embroidered by hand with dabka, salma, sitara (sequins) colored thread and kalabatoon (golden/silver thread). These clothes are reminiscent of the Moghul Empire's era when the kings and queens of the India wore heavily embroidered dresses made from real gold and silver threads. The dresses for the two main events i.e. the wedding (Shaadi) - an event by the bride's family and the Valima - event from the groom's side are made by the groom's family. There are several other events prior to these two main events. Most of the colorful and heavily embroidered dresses are made in certain favored styles i.e. Shalwar Kameez, Saree, Gharara, Sharara or Lehnga, Angarkha and some western fusion styled culottes and palazzos with Pakistani styled shirts of all lengths. There are some designers who have truly established themselves as the 'brand leaders' in bridal wear. 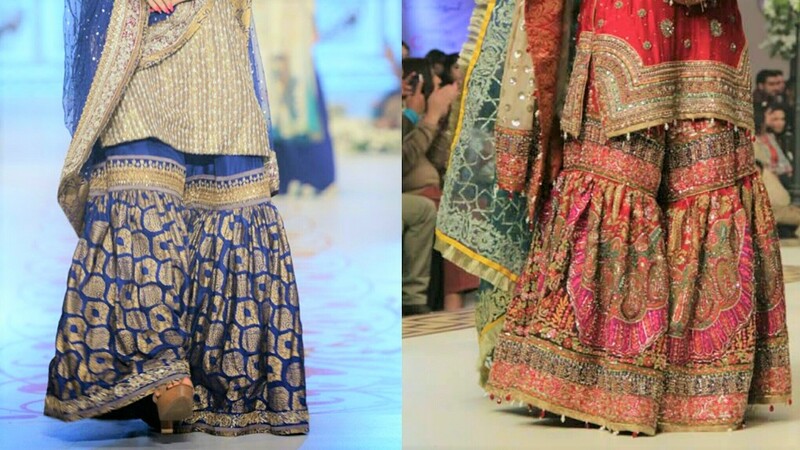 Many male designers have also started to make bridal clothes as this is one of the most lucrative trades that women pursue. Each suit or 'jora' costs anywhere from Rupees 200,000 to Rupees 500,000 and more depending on the buying capacity of the families. The elegant begums style that was a hallmark of the Mughal empire, is a three piece outfit comprising of a dupatta that is fully covered with embroidery with gold thread, sequines, dabka, and other ornate embellishing that covers the bride's head. The second piece is the shirt which is shorter in length than usual shirts and fits tightly - it also has some embroidery with gold thread around the neck and borders. 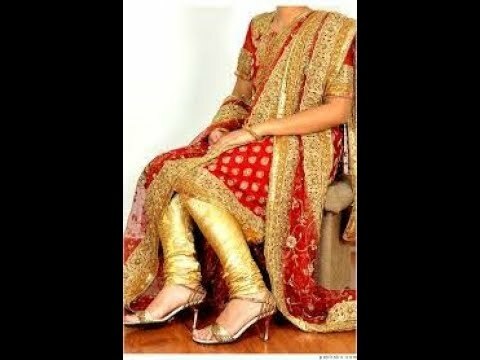 The third piece which gives the name to the entire outfit is the Gharara - it is a two legged outfit with loosely fitted fabric on the thighs till the knees and then flares from the knees to the floor. Some longer tailed variations were called 'Farshee Gharara' which as the name entails reached the farsh or floor. A lively variation is the 'chata-pati gharara' which is made with colorful stripes of fabric. It is quite an art to prepare this style of gharara and some tutorials are available on YouTube on how to cut and stitch chata-pati gharara. 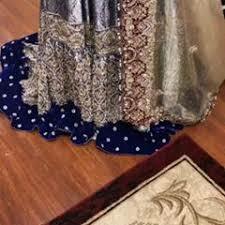 Sharara is a variation of a long skirt that starts from the waist till the floor. This is also a three piece outfit but sometimes made as four piece with a short shirt inside and a pinafore till below the knees. The head is covered with a heavily embroidered dupatta with hand made motifs with colored thread, gold thread, dabka and sequins as the designer deems fit. The same patterns are made on the shirt and the entire diameter of the sharara. 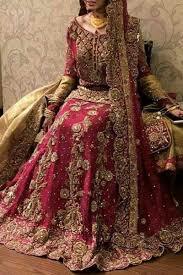 Beautiful outfit which gives a lovely oriental princess look to the bride. 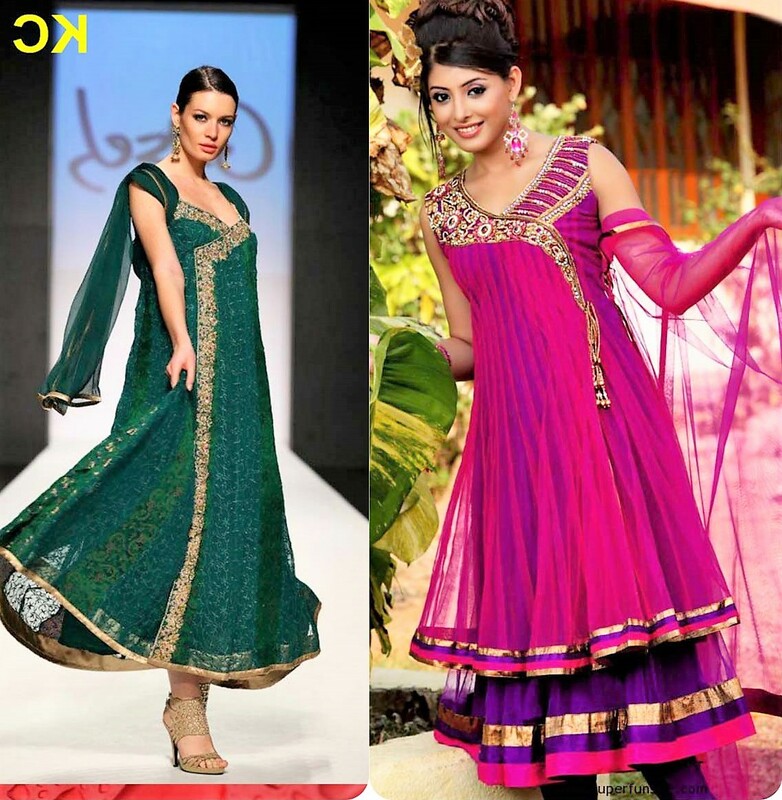 An all time favorite is the Pakistani Shalwar Kameez - also a three piece outfit with a dupatta, shirt and shalwar. Many such outfits are made for the trousseau collection. 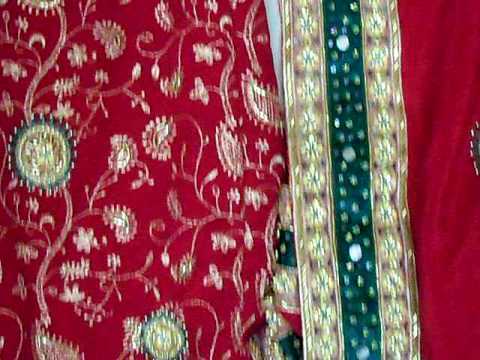 Some brides prefer shalwar suits which are then made with heavy handmade embroidery using the usual golden thread work, colored threads, sequins et al. Angarkha is more like a Kurta with a stylish front that ties on the side.This is also a three piece outfit with a dupatta and angarkha style shirt worn with a churidar pajama (a variation of tights but with beautiful folds formed with the fabric). Some are full length also and with the embellishments done for bridal wear these outfits are a beautiful take on the traditional lines. Easier to manage, a lot of girls opt for this style for their wedding dresses. Traditional Mughlai outfit which in those times was worn more by the domestic staff of the rulers became a fashionable addition to the trousseau wardrobe with time. The outfit is different from the angarkha with the shirt stitched like a frock with a fitted bodice and flowing hemline reaching below the knees. Rest of the outfit is the same with a dupatta and churidar pajama. 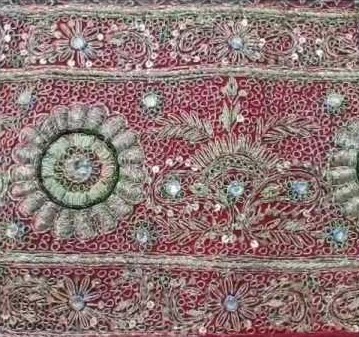 Peshwaz has been seen worn by the kathak dancers in movies. It flows beautifully with the turns of the dancers and look elegant with flowing hems for the brides too. 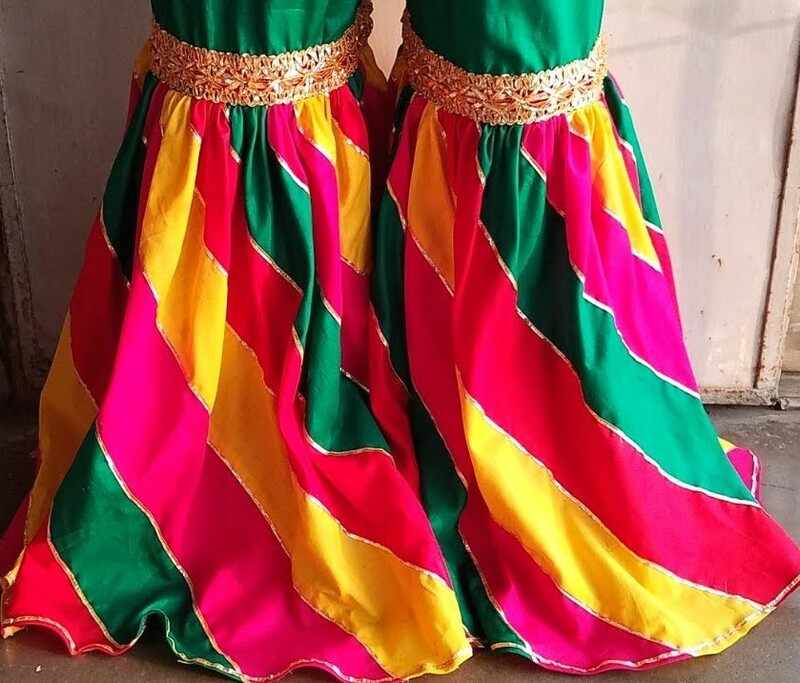 Ghagra Choli is a youngish and pretty outfit with a blouse as a top which may or may not come up to the waist while the flowing skirt like garment as the lower of the dress. 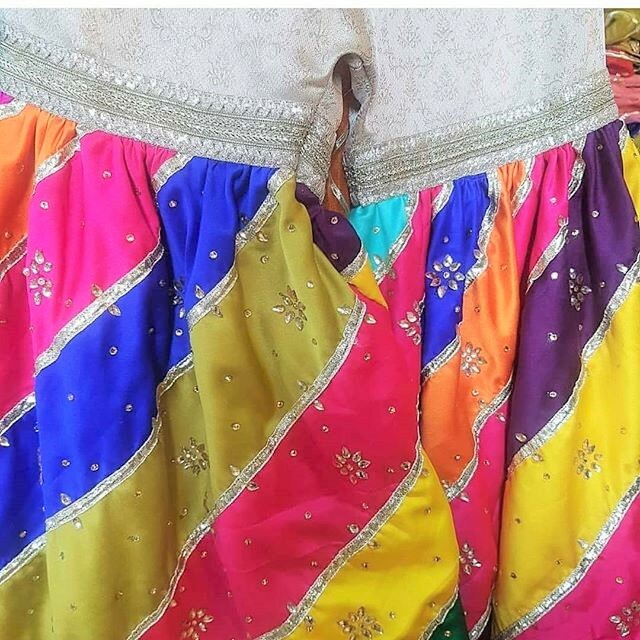 It has a beautiful dupatta and some times a pinafore-like upper that goes upto just above the ankles. 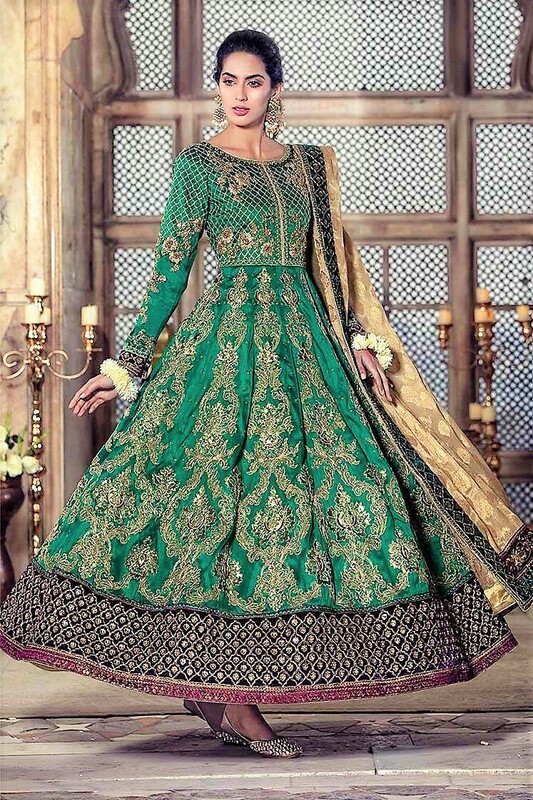 Elegant yet playful this outfit is favored by brides for wedding or for Valima occasions. Heavily embellished with hand crafted art these dresses also provide the kind of glamour every girl looks forward to for her bridal attire. 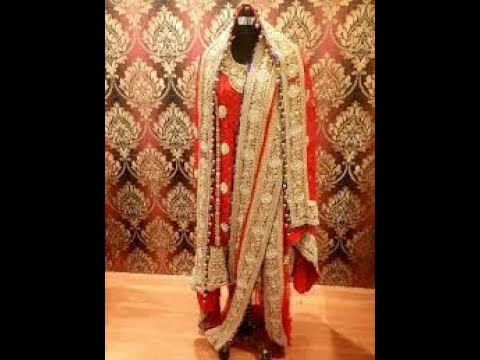 Royal attire of the nawab begums of the state of Hyderabad in India, the Hyderabadi Khara dupatta is an elegant and all time favorite of a lot of brides. The style of wearing or draping the long dupatta is an art in itself for which you can find a lot of YouTube videos. This is also a three piece outfit with the gorgeous long dupatta ornate with heavy hand embroidery done with golden thread, dabka, sequines and colored threads. The shirt can be in the style of 'angarkha' or any other style and the lower is essentially a churidar pajama made with high quality fabric like banarsi, silk, and other. The ever elegant outfit of the Indo-Pak region, Saree has been an all time favorite as a distinguished attire. Though the fashion has reduced for bridal wear some still prefer to sport a Saree on one of the main wedding events. Trousseau shopping is always a fun adventure for every bride-to-be. 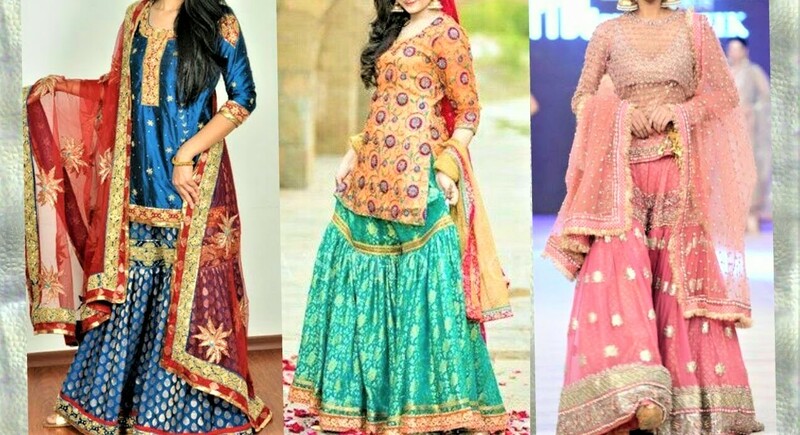 Even with high end fashion designers opting for these garments there are a lot of other outfits that are required to be made to have a decent size trousseau collection.